The promotion of Kenneth D.
Greenville, Miss., firm which spe- cializes in new construction and repair of inland and offshore ma- rine equipment. Marine in September of 1973 as controller-purchasing manager. With this new appointment, Mr.
Griffin's duties and responsibil- ities will be broadened to assist in general day-to-day manage- ment, in addition to being direct- ly responsible for the account- ing and purchasing departments. A new port will be developed on the Colorado River southwest of Houston, Texas. The U.S.
Bay City, Texas, Port Authority to proceed with port construc- tion at the mouth of the Colo- rado. City to handle larger cargoes. Gulf to the intracoastal water- way, a harbor and turning basin at Matagorda, and public recrea- tional facilities along the channel. Co.'s drydocks at Balboa into a modern repair facility. A few weeks ago the group, which includes Chantiers Navals de La Ciotat, received approval from the Panama Canal Commis- sion on a tender solicited two years ago. Astilleros Balboa S.A., under a 15-year concession from the Ca- nal Commission expiring in Au- gust 1996. Balboa Assistance S.A. with the nominal capital of 100,000 francs. French company by Sofremer, the state-controlled French maritime engineering company. Market studies indicate the Bal- boa capacity should be between 800,000 and 1,000,000 hours of work a year. It is located at the Pacific end of the canal, which more than 12,000 ships transit yearly. 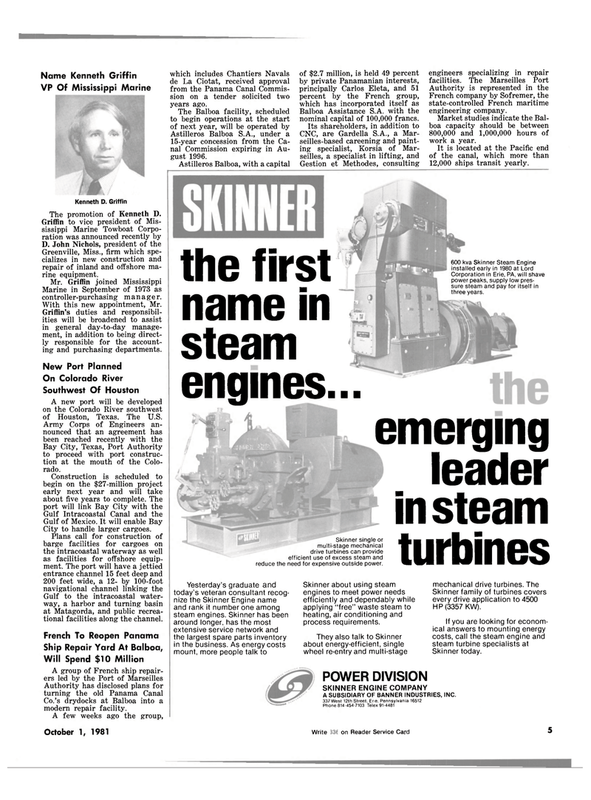 Skinner about using steam engines to meet power needs efficiently and dependably while applying "free" waste steam to heating, air conditioning and process requirements. Corporation in Erie, PA, will shave power peaks, supply low pres- sure steam and pay for itself in three years.